Our last story found a boy fishing, when he encountered a group of men, who he follows. You can read the first part here. Andrew has been following the Master for a year and learned to keep a watchful eye out, because he never knew what could happen. A few days ago, The Master had healed a man who had been lame from birth. This didn’t sit well with the religious rulers. They didn’t understand the Master and were angry that the Master had healed the man on the Sabbath. Andrew kept a watchful eye out for problems that may arise. Andrew, his friends, and the Master came over to Galilee in a boat. He thought they would be able to spend some quiet time just the twelve of them with the Master. They left the boat and walked along the coastal road when he saw the boy. The boy had been fishing. The master, as was his habit, took notice of the lad. The scruffy child gathered his things and followed them. That’s when he noticed the huge crowd also following. “Not again,” were his thoughts. So many times crowds of people followed the Master. Some asked to be healed, others wanted to be entertained by watching the Master perform a miracle. A handful of them listened intently to what the Master taught. Andrew knew there were a few who reported back to the rulers who didn’t like the Master. The area was grassy. It took a while for the people to set themselves into groups. The twelve disciples counted five thousand men, not counting the women and children. 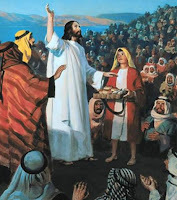 Andrew gave the five loaves and two small fish to Jesus. Jesus blessed the meal and started breaking the bread apart. He dropped the portions into baskets. Then he took the fish and did likewise. He told the disciples to distribute the baskets full of bread and fish. The people ate till content and full. 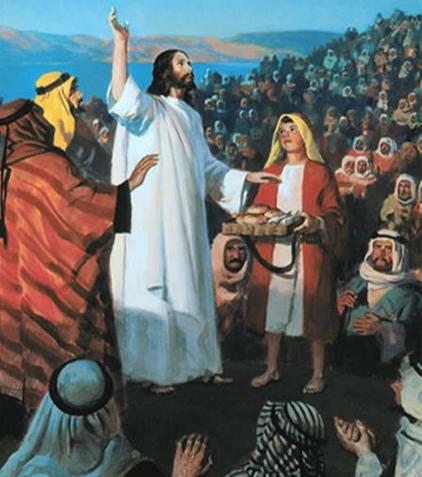 The disciples retrieved twelve baskets full of portions of food. Andrew was amazed! More than five thousand fed and twelve baskets brimming with food—all out of only two fish and five loaves. Andrew smiled and rubbed the top of Benjamin’s head. He grabbed handfuls of food and stuffed it into the satchel Benjamin had over his shoulder. Benjamin looked one last time at the Master. Jesus focused His attention on Benjamin and smiled. Benjamin smiled back and then raced home to his Mother and brother Joshua. The family enjoyed the meal. That day was one of the best days of Benjamin’s life. He had met the Master! He shared his food with Him and saw Jesus make a miracle. Benjamin learned to believe that Jesus was the Messiah. Benjamin knew in his heart that only God could have done the miracle he witnessed. Benjamin did a great thing. He shared his small meal. What could have happened had he not shared? I think he would have missed a blessing. Jesus would have done the miracle another way, but Benjamin would have missed out. We need to be willing to share. Do you share your food and toys with others? The boy and disciples and Jesus are true people and this event really happened. My imagination made up the boy’s name and events leading up to him being near to share his food that day. Then boy really shared his two fish and five barley loaves and Jesus fed the five thousand. This true story is out of the Bible told in all four gospels. You can read it in Matthew: 14:14-21, Mark 6:30-44, Luke 9: 10-17, John 6: 1-14. Please memorize: Proverbs 22:9a He who has a generous eye will be blessed.